Gallery Lilja Zakirova introduces the Russian visual artist Nicolai Pollisky to the Netherlands with 7 large photographs. Besides at home, Polissky has been noticed outside of Russia since 2001. 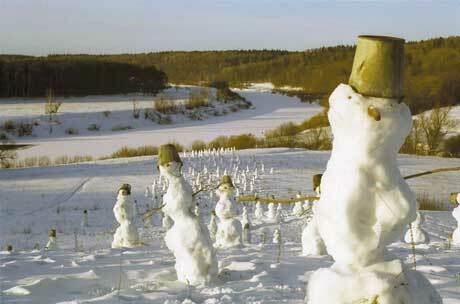 With Snowmen Pollisky shows the representation of a scenic project which he carried out some 200 kilometres south of Moscow during the winter of 2000-2001. 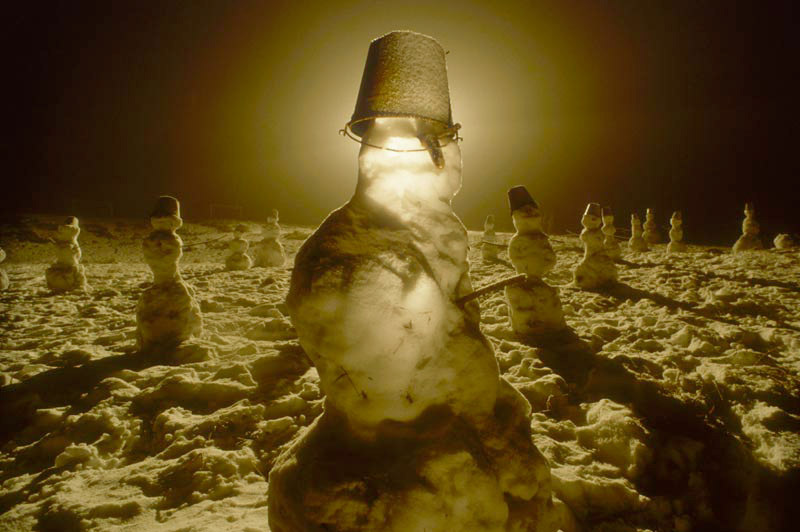 A large number of snowmen, completed and adorned with carrot noses, charcoals and twigs, serving as eyes and mouths, and buckets as headwear, make up a seemingly endless procession through the snow-covered landscape. They seem to emerge from the river flowing behind the wide, disorderly procession. All noses are turned in the same direction; once begun, it seems the journey cannot be stopped. 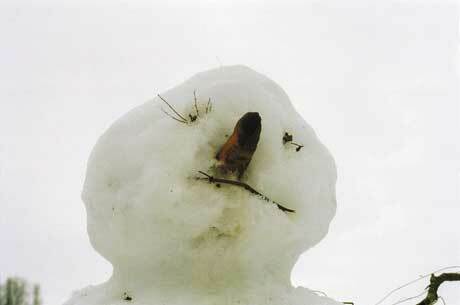 Here and there a snowman has fallen over and he lays aside, grown still. The others take no notice of him. Pollisky seems to portray the journey of humankind. Originating from the same source, shaped of the same natural material, on its way to its end. 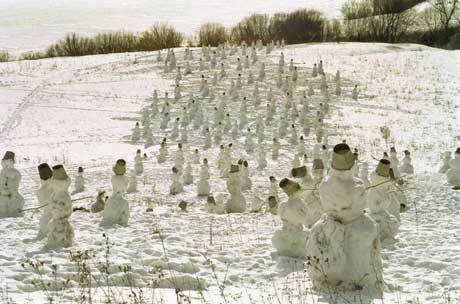 The spring following the winter will finish these creatures off. 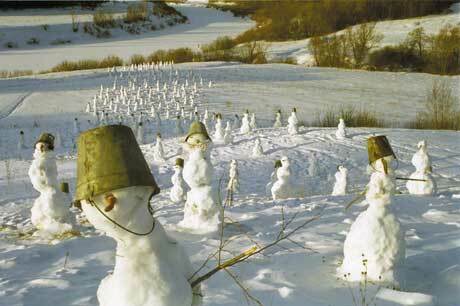 Scattered buckets will fleetingly remind us of their existence. 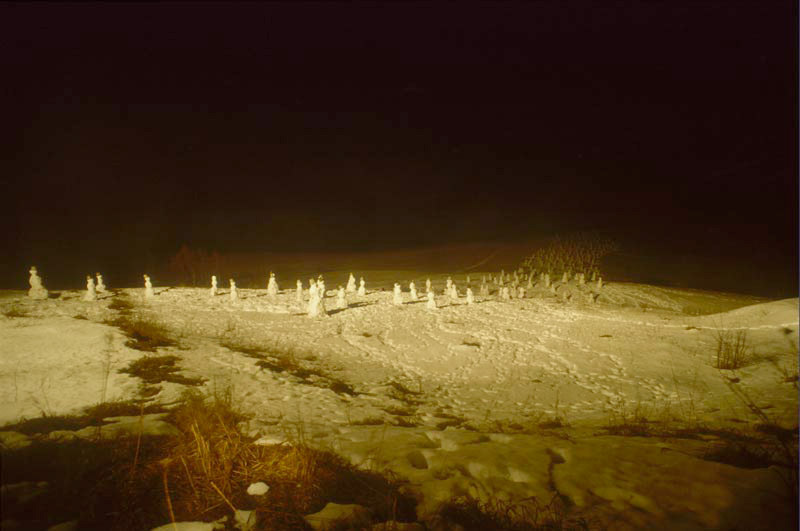 With this scenic project, as well as with a number of other projects he executed in natural materials, Pollisky can be counted as one of the representatives of conceptual land-art. Basically Pollisky works with natural materials, in the landscape, often also in co-operation with the local population of the area. Originally Pollisky was educated as a painter at the Art Academy of Saint Petersburg, where he graduated in 1982. During the Eighties he became interested in non-academic mediums of art, as his participation in the MITKI movement in Saint Petersburg showed: an artistic alignment pursuing non-academic expressions of art. During the Nineties he worked as an expressionist landscape painter and from there he has developed into a land-art artist. 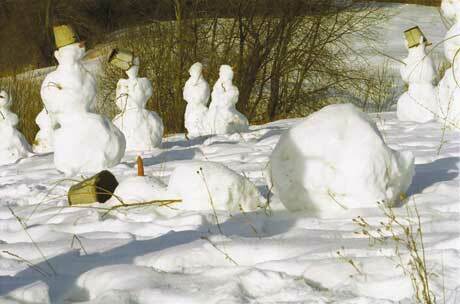 The Snowmen project was his first project. He has recorded it with photos, which are then allowed to be exposed as autonomous works. Reminiscences of an event. Ultimately, mental action is the main element in Polissky’s art; the event is temporarily, material wastes away or disappears, the idea remains in the memory. He considers the memory the best place for his works of art.